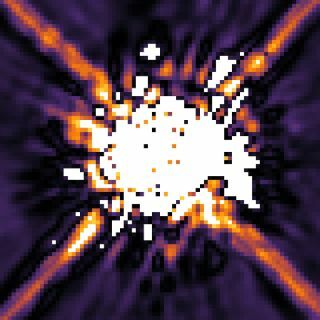 This image of the star HR 8799 was taken by Hubble's Near Infrared Camera and Multi-Object Spectrometer (NICMOS) in 1998. A mask within the camera (coronagraph) blocks most of the light from the star. Scattered light from HR 8799 dominates the image, obscuring the faint planets. "We're only going to look at archive data — only what there is in the NICMOS data," said Remi Soummer, of the Space Telescope Science Institute in Baltimore, Md. Soummer was a member of the research team that found visual evidence in the old Hubble data of the alien planets around the star HR 8799. Soummer presented the technique and the exoplanet findings Monday (Jan. 9) here at the 219th meeting of the American Astronomical Society. "I really hope we find something, but I don't want to say any numbers," Soummer told SPACE.com. "Finding planets is really hard. I hope at least one new system exists there, but it's unlikely that we're going to find many." The left image shows the star HR 8799 as seen by Hubble's Near Infrared Camera and Multi-Object Spectrometer (NICMOS) in 1998. The center image shows recent processing of the NICMOS data with newer, sophisticated software. Further processing reveals three planets orbiting HR 8799. The illustration on the right shows the positions of the star and the orbits of its four known planets. In the HR 8799 system, there are four known planets circling the parent star, which is approximately 130 light-years away from Earth. Using the archival data from Hubble, Soummer and his colleagues were able to find all three of HR 8799's outer planets. The fourth and innermost planet was not detected by Hubble's NICMOS instrument because it was blocked by light from the star, the researchers said. The three outer planets in the system are large and have very long orbits, taking 100, 200 and 400 years to circle the star. This means that astronomers would have long waits to observe the orbital motion of these planets. But, one of the main advantages of the NICMOS data is that it already provides scientists with a decade of data at their disposal. "Basically, we have 10 years of science that we can get immediately," Soummer said. "It's a snapshot of planets, and all the data is already there. It's free and it's available." The exoplanets around HR 8799 went undetected in 1998 when Hubble first took the images because planet-hunting methods were not available at the time. Now, sophisticated planet-hunting techniques are employed by a variety of space- and ground-based observatories, and the Hubble archives could play an important role. "Say we discover a new planet in one of these images, all of these images are old, but they can be confirmed by observatories like Keck," Soummer said. "Then, we potentially have information about orbital motion."